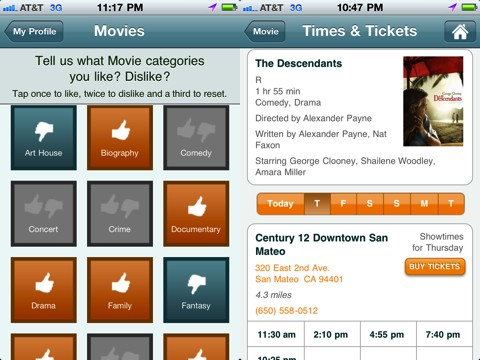 Do you love to check out movie, book, and restaurant recommendations from iPhone apps? Would you love the chance to buy a ticket to a highly recommended movie, download a book, or reserve a table from the same iOS app? The Jybe iPhone, iPod Touch, and iPad app combines great reviews and suggestions, tools to immediately experience them, and handy saving features to build wish lists. The Jybe iPhone, iPod Touch, and iPad app can be accessed with a sign in from your Facebook, Google, Twitter or email account. The email sign in features an excellent interface and navigation. Once you verify your email address, you are immediately redirected to the Jybe iPhone app. This is a subtle, yet effective functionality. You don’t find yourself scrolling through pages of other iOS apps that may distract you and prevent you from coming back to the Jybe recommendation app. The Jybe iOS app features a clean, modern home screen. Your profile and settings may be accessed with a touch on the appropriate icons at the top of the screen. You may explore dining, movies, books, leap of faith, and help categories from your screen. On first touch of a category, it lets you choose what you like or dislike. The likes and dislikes are established with gesture controls. Tap once to like, twice to dislike, and three to reset. Once you make your selections, you are presented with a list of recommendations. For restaurants and movies, the list is sorted by nearest to you. For each item on the list, you have the name of a restaurant, movie, dish, or book with a brief statement explaining the item’s relevance to you. If it is a match, it will simply state why it’s a match. If a recommended item meets several of your preferred criteria, then the Jybe iOS app lets you know it is a strong match and how the Jybe iPhone app made that conclusion. If Jybe doesn’t think you’ll like it, then it will nicely state as much. For restaurants and dishes, you can select more details to learn about the restaurant or dish. You can check out the menu, comments and recommendations of others, a restaurant’s hours, a chance to book a table via OpenTable, or call the restaurant from within the Jybe iPhone, iPod Touch, and iPad app. For movies, you can check out trailers and buy tickets from Fandango. If movies are not currently in theaters, you may purchase them or add to your Netflix cue. For books, you can order from iTunes and Amazon. Jybe also encourages you to like, dislike, save, or share via text, email or with social networks on Twitter & Facebook with simple functionality. Recommendation iOS apps are rich in content, and some developers have a tendency to overwhelm the iPhone, iPod Touch, and iPad screen with too much information in a poor layout. 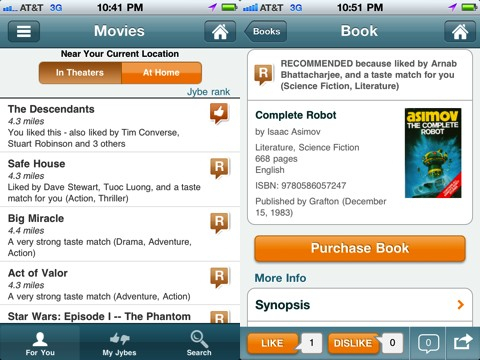 However, Jybe is among the most user-friendly and intuitive recommendation apps I have encountered. There is depth and breadth of information; opportunities to share, like and comment; and integration with the iTunes store, Amazon, Fandango, Netflix, and Open Table. With Jybe, all of these features are well-crafted and arranged logically. You can access just as much information as you want with excellent filters. You don’t have to scroll through tons of details to find those that interest you. The filters provide smooth function, and you can always hit back or home from any window. The arrangement of the comments and likes is a perfect example of the efficient interface. Clearly taking a nod from the Facebook iOS app interface, you simply have a tally of likes and comments. If you want to dig deeper, you can check out all of the comments and likes. But, these details are your choice to examine. One of Jybe’s coolest features is the ability to categorize your saves. You can add to a wish list, things for later, and movies you own. With recommendation iOS apps, we want to explore. Perhaps, we want to act immediately, or we want to be able to revisit items that interest us quickly and easily. We don’t want to try to remember who posted what, when, and where. The Jybe iPhone, iPod Touch, and iPad app makes up for a poor memory or laziness–for those of us who never created a pinboard for things to do later on Pinterest. Jybe brings a new dimension and perspective to iOS recommendation apps. It is free for download, and it shouldn’t be free with the incredible functionality and great tools it provides. AppSafari review of Jybe was written by Jenni Ward on May 25th, 2012 and categorized under App Store, Directories, Events, Featured, Free, Local. Page viewed 4463 times, 1 so far today. Need help on using these apps? Please read the Help Page.